Last Friday, I presented to a group of teachers about workshop efficiencies and conferring. 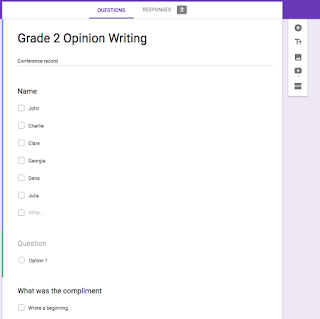 One of the practices I shared involved using Google Forms. During the last two weeks, I've been forced to use Google Forms twice, once to collect responses from teachers about choice workshops and once for the slicing world--many of you may be about to fill out the Participant Form for the Weekend Slicing Challenge. 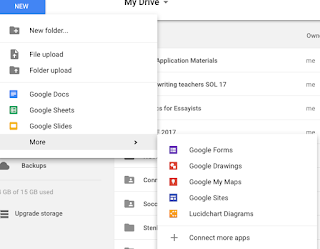 When you do that, think of me--it was my second ever Google Form! 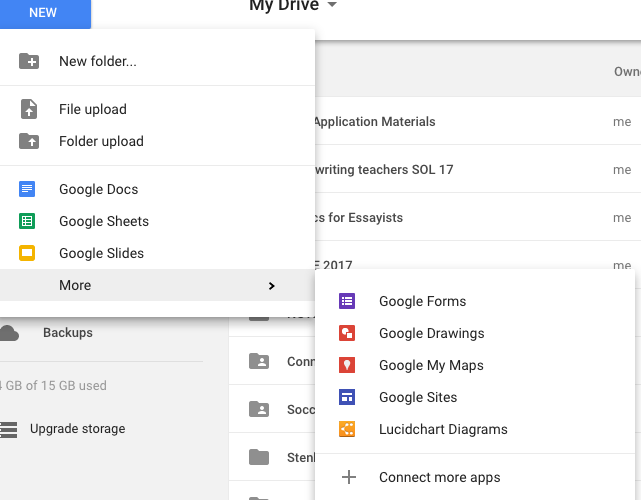 If you use Google Drive, and you've made a document, folder, or slide presentation, just go a little further in the drop box, and make a Google Form. Create a form. In my case, I made a sample one for a second grade opinion writing unit. For the first question, I entered names. Mine are hypothetical, but I plan on making one that includes all of the students I am targeting in my coaching work. A teacher could enter the students in a classroom. I made this list a checklist form so that if I were doing a partner conference or a small group, I could enter the information all at once. This form is shrunk down so you can see more of it. It's so easy to get results and create a record in various forms of my conferring! You can click on responses, which is at the top right of the form, and you can also make a spreadsheet. It's automatically date-stamped, and it can be sorted and manipulated however you'd like! What an amazing way to keep instruction focused, track teaching, and maintain records. Love this! Thank you for hosting this community, Margaret. Melanie, Putting the names as a checklist is a good innovation instead of typing them in or only being able to select one. I think this may be a good scaffold for teachers too, because how handy would it be to have a menu of likely foci for compliments and even next steps. 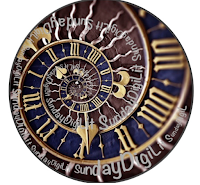 Have you found it easy to navigate as you're sitting alongside readers and writers? OMG....You are on to something!! Thanks for sharing. I've used a few forms but I definitely need to start using it when conferring. I am such a bad note-taker but his might work for me. I'll keep oyu posted! Thanks for this timely tip. I don't create google docs enough, so this was helpful. Have you seen docAppender? Some of the teachers I work with use it to help organize when they conference with kids. Basically it takes the data on the Google Sheets and makes it easier to read. 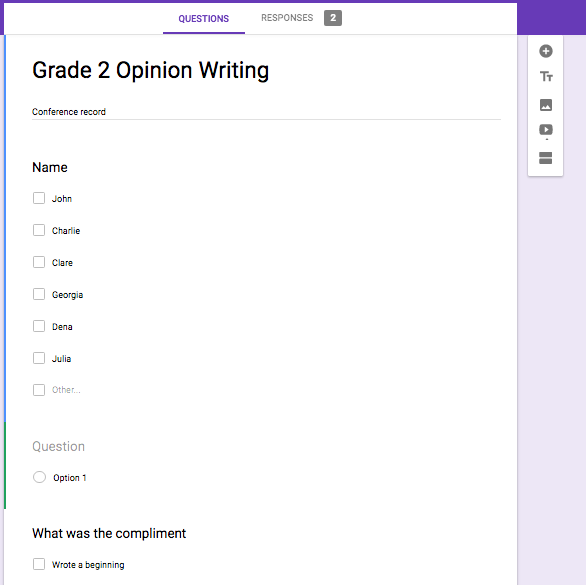 Great way to use Google Forms, Melanie! So many teachers rely on their memory but then when pressed to form groups for specific study don't have any data or notes to reference. this would be helpful. Thank you for this post. I have seen many people post directions on the TCRWP facebook page and want to try them but haven't as of yet. Your slice is encouraging me to try. I love the compliment in standard form. Thank you again!! I have never used Google forms. Thanks for this informative post. I know who to call if I ever want to make a form. Thanks for joining in DigiLit Sunday! It is amazing what one can do for technology. This post is so helpful because you explain both the technology and literacy aspects. Often you get one or the other. We will certainly share this with teachers - great way to organize, display and use assessment. Thank you.